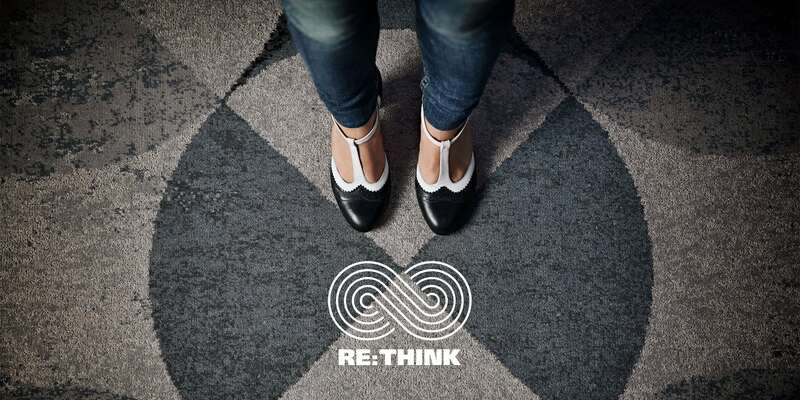 Colortec RE:THINK is our Cradle to Cradle CertifiedTM Bronze carpet solution and the world’s first and up to now only Cradle to Cradle CertifiedTM Colortec carpets. With the certification of Colortec RE:THINK we have achieved strong and visible recognition of our concentrated efforts to run our business sustainably. It is not just something we talk about; it is something we act upon. Read more about Colortec RE:THINK and Cradle to Cradle. Colortec carpets are manufactured with modern tufting technology. Colortec is, compared to woven carpets, a high output production. Colortec tufted carpets are not printed, but using the same type of pre-dyed woollen yarns as woven carpets. This gives the carpet a woven look and ensures great color brilliance and clear design definition. Colortec provides unlimited design possibilities using up to 7 colours and qualities range from 1100 g/m2 to 1900 g/m2. Dansk Wilton produces custom design Colortec carpets using only pre dyed yarns in an 80/20 wool blend. Colortec is produced in 400 or 500 cm width with an integrated felt backing which optimizes the handling process during installation. Colortec carpets are used for areas where longevity and design flexibility are essential. We have a wide range of qualities suitable for all areas – from hotel rooms to high traffic public areas. Dansk Wilton was the first carpet manufacturer in Europe to start production of Colortec carpet solutions.